With the sheer amount of video content freely available at the moment it’s a real opportunity for teachers to embrace flipped classrooms settings. Currently you may ask a student to watch a video via a link you have sent them or embed the video into a Moodle course however this is quite passive and how to you check to see if the student has engaged with the content? 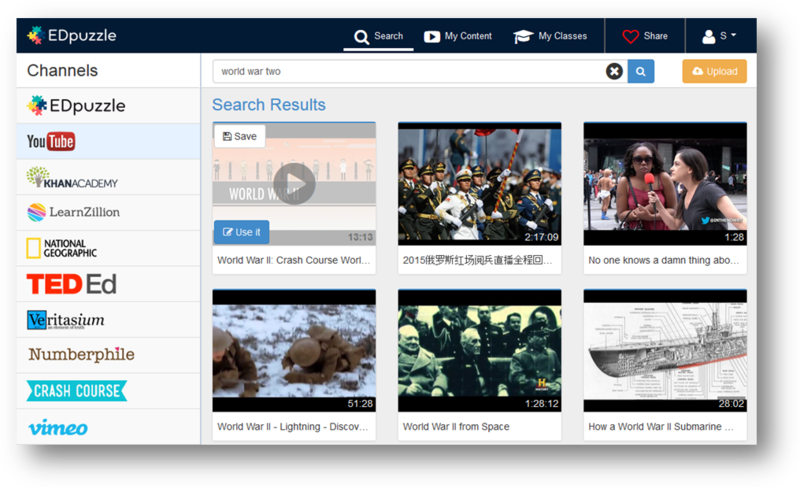 This brings us to the tool of the week EdPuzzle, which allows teachers to take a video from the likes of YouTube, Kahn Academy, Learn Zillion, Crash Course, alternatively upload their own video (maximum file size 1gb) and edit the portion that they need. 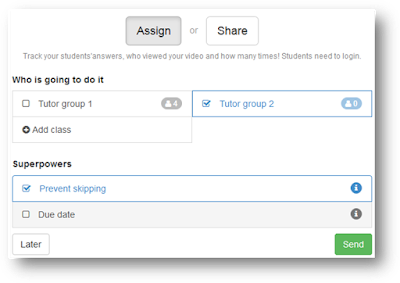 The uploaded video can then be cropped to shorten the video so just the relevant part is selected for their lesson they are teaching. The teacher then has the option to record their voice to be played whilst the video is being watched. The quiz feature then allows teachers to embed questions to appear as students are watching the video. 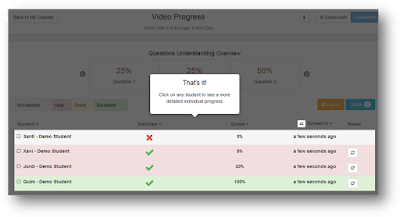 EdPuzzle is a free tool which does not place any restrictions on the number of videos, classes or students that you can have against an account. Navigate to https://edpuzzle.com then click on the Sign up button (situated top right) to create your free account. 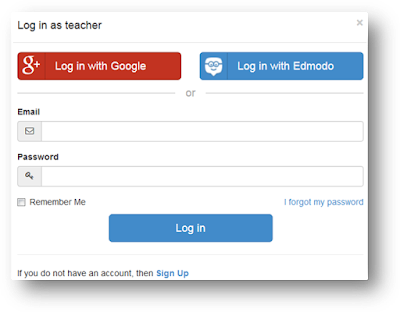 If you have a Google or Edmodo account then you can speed up the process by logging into the associated account. 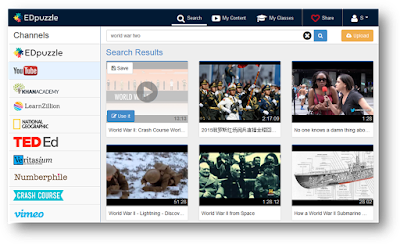 After your account has been created you need to either locate a video for your quiz either using the search function or by clicking the upload button. In this example I will be using an existing video from YouTube. Hover over the video you wish to use and click on the Use it blue button that appears. 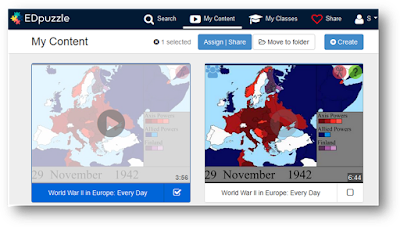 Once you have selected the video you will be automatically taken to the cropping tool which allows you show the section of the video you want students to watch instead of the whole thing. Unfortunately there is no option to select different parts of the same video or combine two or more videos into one quiz you therefore have to create a separate quiz for each segment of the video. 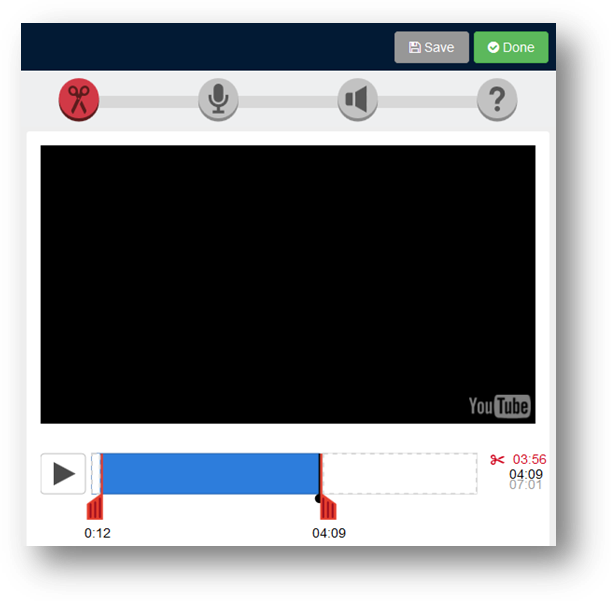 The next tool you have at your disposal is the audio track option which allows you to add an audio recording to the video. Please not that you must record the audio for the whole duration of the video to be able to save it. I found the Audio notes a more useful tool than audio track as it gives you the freedom to add audio anywhere and any length in the video. Simply click the yellow audio mic icon to record and then click the yellow stopped button to attach the audio to the particular point in the video. Repeat the process as many times as required throughout the video. 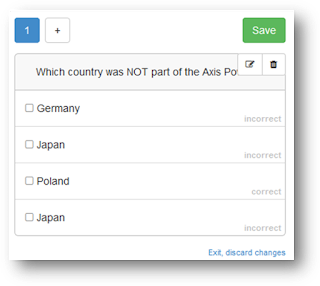 This the unique feature of EdPuzzles that provides you the ability to insert quiz questions through the duration of the video. Click anywhere along the time navigation bar where you wish to insert a question. Once you have located the desired location in the video click on the green question mark tab. 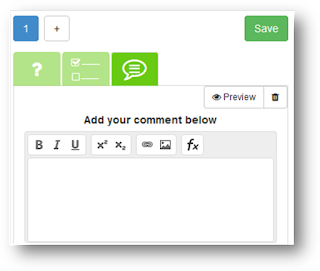 You are then provided with three types of questions you can add to your video, which include Open Ended, Multiple choice and Comment. 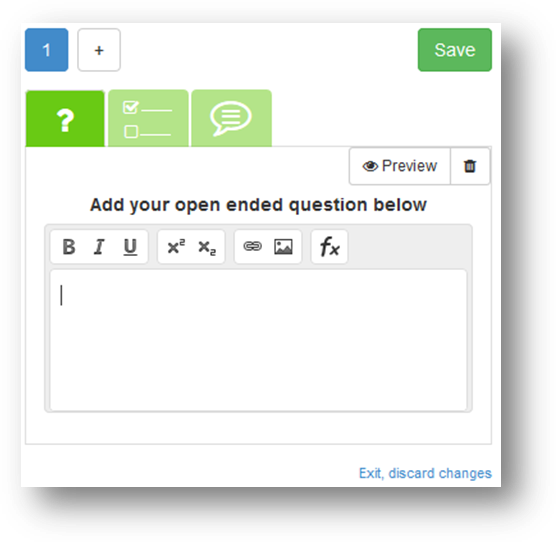 Open ended question – basically asks students to answer question in a text box. The drawback with this is that the answers will have to be manually checked and there is no function to check as they continue to watch the video. 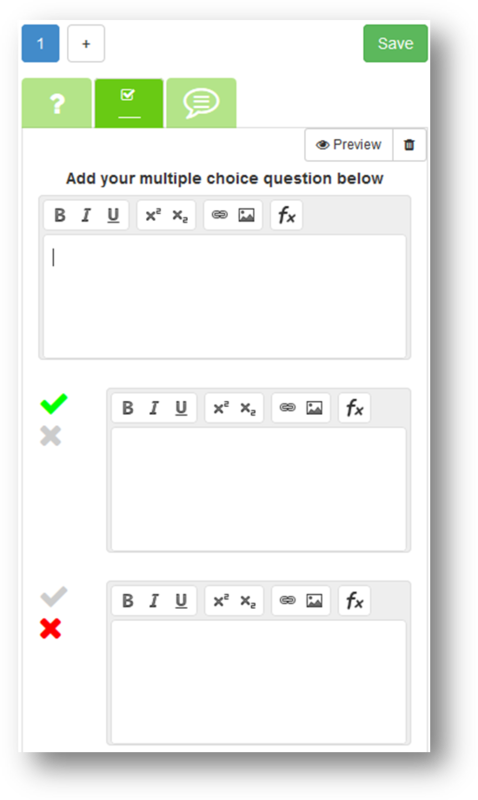 Multiple choice – insert your question in the top text box and then add the number of choices you wish to offer remembering to select the tick to indicate which option(s) is the correct answer. 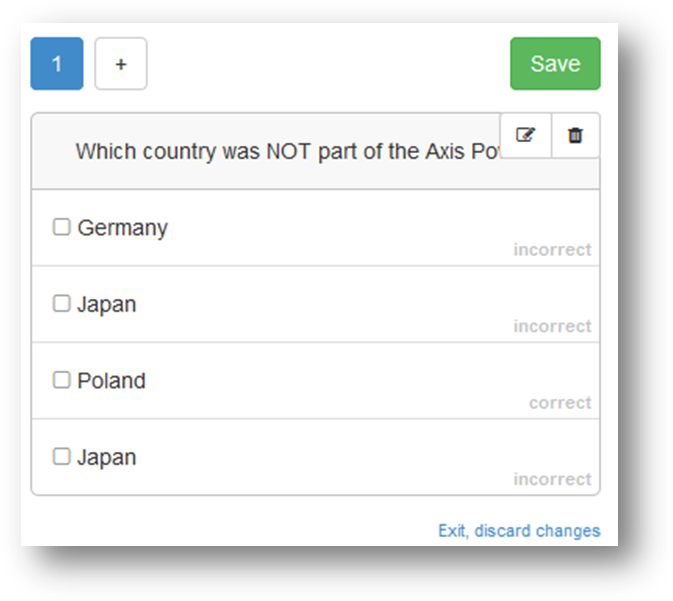 The benefit of using multiple choice questions over the other two options is that questions automatically graded. 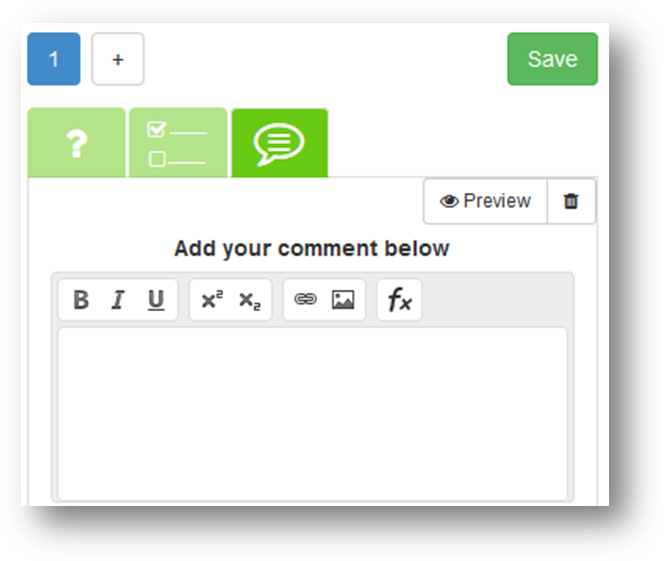 Comment – allows viewers to make comment at certain points of the video. 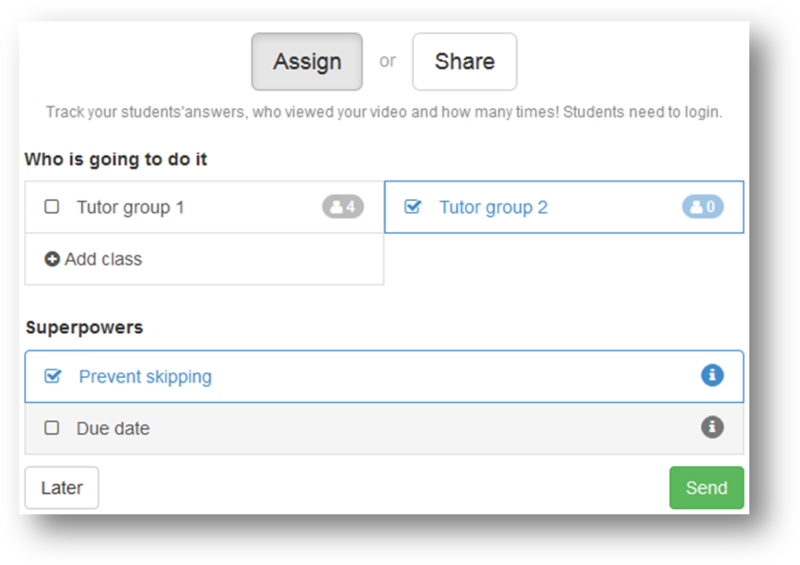 Once you have added your questions to the video you then need to assign a class to the video. Give the class a name and then decide if you wish to prevent student skipping questions. 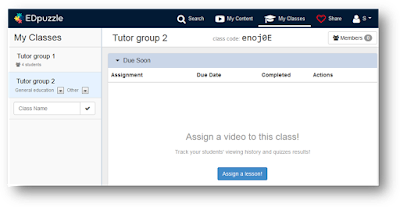 If you wish to set a date of when students can access and complete the video quiz then select the Due date option and then specify the dates. To finish click the Send button. Under the Actions heading click on the blue Progress button to view which students have watched the video. I found the graph particularly useful as it displays which parts of the video the student watched and how many times, as well as which parts of the video that the student skipped. EdPuzzle allows you to reuse the same video assignment for other classes. 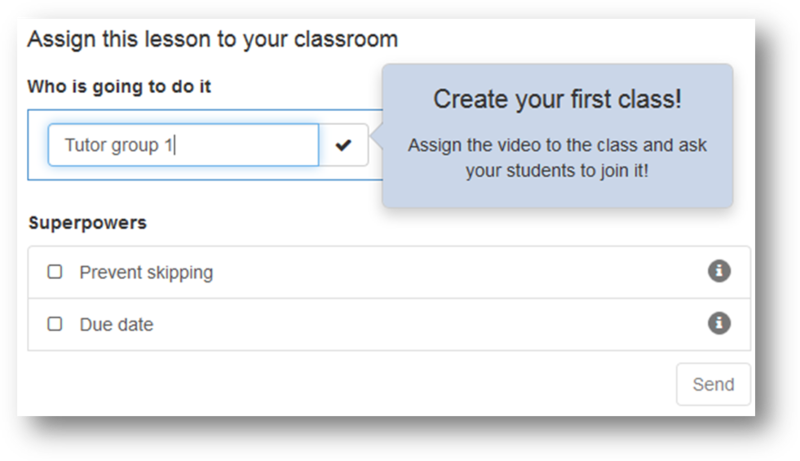 To do this simply select the My classes tab from the top, click the class you wish to add the video to and then click the Assign a lesson button. Check the tick box to select the video and then click the Assign | Share button. Select the class, set the Superpowers options and then click the Send button. You are then present with the class code which you will need to share with the class so they can access your video. 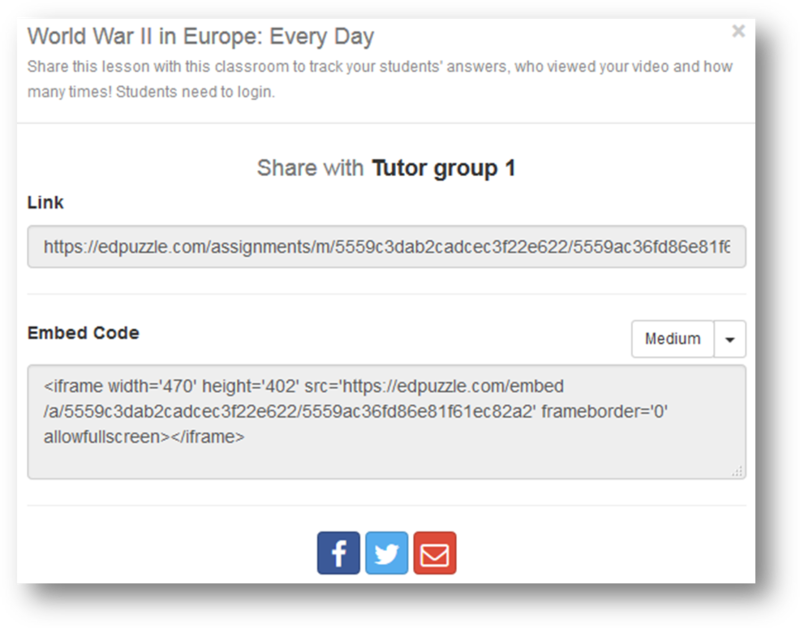 A useful feature of EdPuzzle is the ability to obtain the embed code for the video quiz. Simply click the share option instead of assigning the video. Alternatively you can share the quiz via email or social media. 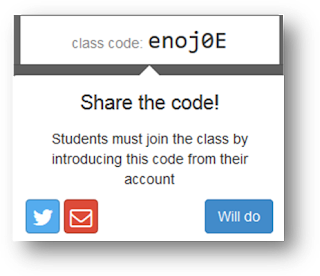 · Students will have to create an account and add their class using the class code. Once they get enrolled, they will receive all the videos and projects that you assign to that class. · Students can also create videos that will remain private between them and their teacher. By default students are allowed to answer once, and no amendments can be made once the answer has been submitted however there is an option to give the student another opportunity via the class progress view. 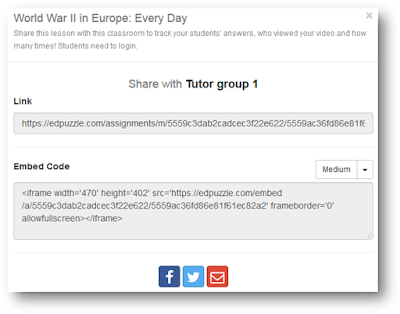 · All videos are public as EdPuzzle believe that there should be a platform where teachers can share and reuse incredible video lessons. If for some reason you want your videos to be private you can contact EdPuzzle who can then make your video private. · Although EdPuzzle works well with tablets and mobiles there are no voice recording functions available for them. 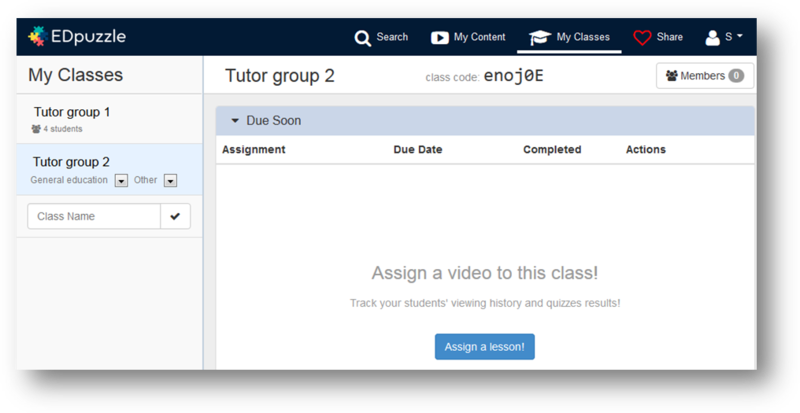 · Students cannot just be provided with a direct link with the assignment as they have to log into EdPuzzle and use the supplied class code to access the video. I found EdPuzzle an effective tool for creating quick video lessons from existing video content, and would highly recommend it for teachers who would like to flip their classes to engage students whilst collecting data as they watch and interact.